The knee is the largest and most superficial synovial joint in the body. It is a hinge type joint with articular surfaces characterized by large sizes and irregular shapes. It is composed of three functional articulations: the weight-bearing medial and lateral femorotibial articulations, between the femur and the tibia, and the femoropatellar articulation between the patella (kneecap) and femur. The latter allows the pull of the quadriceps femoris muscle to be directed anteriorly over the knee to the tibia, preventing tendon wear. Two c-shaped fibrocartilaginous medial and lateral menisci attach to the intercondylar region of the tibial plateau. They accommodate changes in the shape of articular surfaces during joint movement. The knee joint mainly allows flexion and extension. However, a more intricate and complex set of movements like gliding, rolling, and rotation about a vertical axis occurs as well. The joint capsule of the knee joint typically involves an external fibrous membrane and an internal synovial membrane. The fibrous membrane is thickened in some parts to make up the intrinsic ligaments, but otherwise is thin and incomplete in some areas. The extensive synovial membrane lines all surfaces bounding the articular cavity that are not covered by articular cartilage. The joint capsule is reinforced by both extracapsular (intrinsic) and intra-articular ligaments. The five extracapsular ligaments are the patellar, fibular and tibial collateral, oblique popliteal and arcuate popliteal ligaments. The intra-articular ligaments within the knee joint consist of the anterior and posterior cruciate ligaments and the menisci mentioned above. The vascular supply of the knee joint is mainly comprised of the descending and genicular branches of the femoral, popliteal and lateral circumflex arteries in the thigh, circumflex fibular artery and recurrent branches from the anterior tibial artery in the leg. It is innervated by obturator, femoral, tibial and common fibular nerve branches. The tibia is the weight-bearing bone of the leg, hence it is much larger in size than the fibula. Proximally, it takes part in the formation of the knee joint, whereas distally it forms the medial malleolus and most of the bony surface for the articulation of the leg with the foot at the ankle joint. The fibula is smaller, and lies on the lateral side of the leg. Above, it does not take part in knee joint formation, and below its distal end is anchored to the tibia via a fibrous joint, forming the lateral malleolus of the ankle. The leg is separated into anterior (extensor), posterior (flexor), and lateral (fibular) compartments by an interosseous membrane, two intermuscular septa and a direct attachment of the deep fascia to the periosteum of the anterior, and medial borders of the tibia. 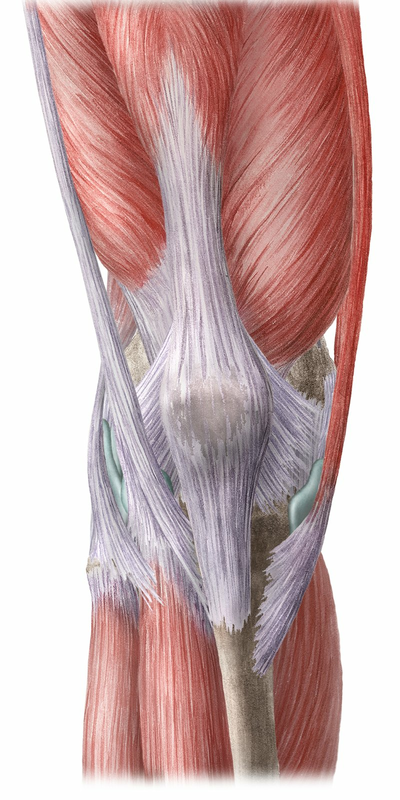 The anterior compartment of the leg includes four muscles: the tibialis anterior, extensor hallucis longus, extensor digitorum longus, and fibularis tertius muscles. They are responsible for ankle dorsiflexion, toe extension, and foot inversion. The anterior compartment of the leg is innervated by the deep fibular nerve. Muscles in the posterior compartment are further subdivided into superficial and deep, with a layer of deep fascia separating them. The three superficial muscles are the gastrocnemius, soleus, and plantaris muscles, while the deep muscles are the flexor hallucis longus, flexor digitorum longus, tibialis posterior and popliteus. Those muscles generally flex the toes and plantarflex, and invert the foot. They are all innervated by the tibial nerve. The lateral fibular compartment is formed by two muscles only, the fibularis longus and brevis. Both evert the foot and are innervated by the superficial fibular nerve. Want to learn more about the Knee and leg?